A good way to make lamp black under field conditions is to make a small table like arrangement of stones. Pitch or pitch saturated wood from pine or other conifers is burned under the top plate and the soot brushed off with a feather occasionally. I have some picture of that somewhere, but they are like that old kind that are on paper… Any kind of oil lamp arrangement with a plate of some kind on top will also work fine. A tuna can with the lid left partly attached and bent down to form a ramp into the oil is an easy solution. A makeshift soot maker that I scrapped together. 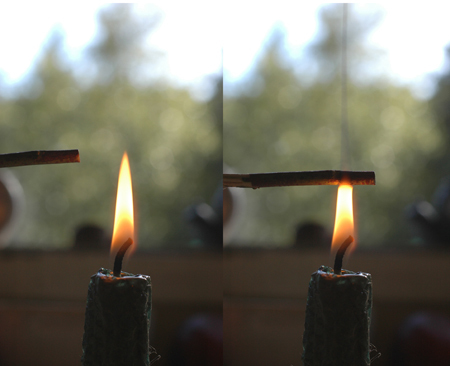 the ramp is made of a scrap of slate and the wick is a wad of cattail seed fluff. The oil can be whatever ya got laying around. This is old rancid sheep or goat fat that has outlived it’s usefulness for much of anything else. 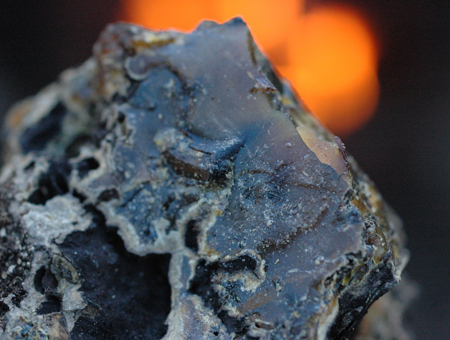 Disrupting the flame with a scrap of slate. The soot collects in a cake on the top plate and is brushed off occasionally with a feather. It takes quite a lot of soot to make a decent sized ink stick. Note the soot curling around the plate. You can never catch it all. Nasty stuff too, don’t breathe it! This is outdoor work. A 60 year old chunk of pitch from a fir tree stump. Pitch is great for making lampblack. Lampblack is not at all easily mixed with water. In fact, it is remarkably difficult to get the two together. One time I was tattooing my friend Wylie’s leg (I have pictures of that somewhere too…) with pine soot and figured out that if I spilled beer into the ink, it mixed easier. Yay for beer! It can be mixed with plain water sometimes if a very small amount of water is used, but it can also be almost impossible and a drop of alcohol helps break the surface tension. Lamp black is much used for tattooing around the world, being much finer than charcoal. I have two small tattoo test spots on my leg made by slicing the skin with obsidian and rubbing stuff in. The one with charcoal is uneven, while the one with lampblack is much cleaner. A third made with iron oxide (red ochre, a mineral pigment) is long gone, having faded away completely. Often lampblack is somewhat oily containing compounds created by the heat destruction of the oil or pitch that are not pure carbon. 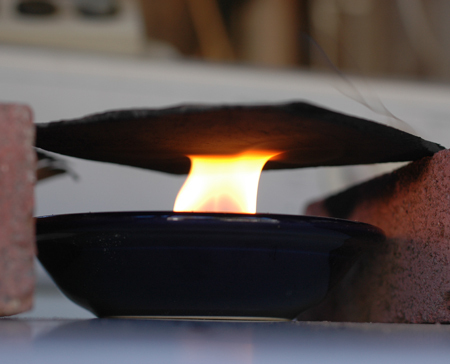 The lampblack can be purified to an extent by re-burning it in an oxygen free environment. 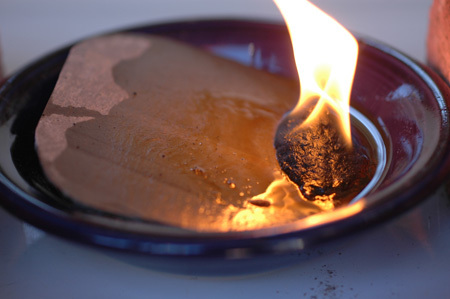 If put in a small sealed tin, it can be burned in a fire to clean it up a little. My results calcining soot this way have been mixed, and I’m unsure whether it is necessary. Another old book (quoted below) recommends packing into an open ended tube for re-burning. I’ll try that next time. Asian inks are usually made as a solid stick by mixing lampblack with a small amount of collagen glue made from hides, sinew or especially antler. 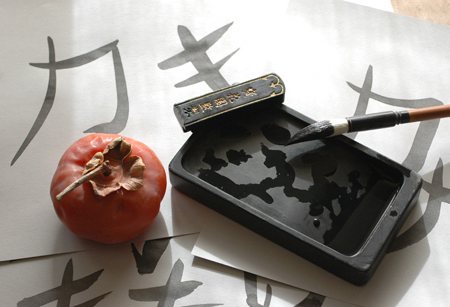 The stick is then rubbed up with a little water on a special stone and the ink used immediately. I hope to do almost all illustrations for paleotechnic’s publications with this type of home made ink, and other home made art materials, from here on out. Carbon ink works great with a feather quill pen (that’ll have to be another post) What is called india Ink is originally a soot based ink as well, but in liquid form. Since I lost the last ink stick that I made (someone probably threw it out, because it looked like a fossilized anteater turd, though it was perfectly functional), and have to make another, yet another future post may just have to cover ink making in detail! For now, you know what lamblack is, and how to make it and you can build from there. If you just want to blacken your gun sights, or whip up some corpse paint, it’s easy to make a small amount of lamp black with a candle or chunk of pitch. Another brick in the wall of self reliance. This is awesome! You just did a bunch of experimenting and research I planned on doing. I’ve done some experiments with oak galls inks, but not lamp black yet. Have you experimenting dyeing bark tan with lampblack ink at all? I’m trying to find an alternative to the vinegar-iron oxide black technique. I’ve gotten OK results with oak gall inks, but it usually turns out a dark brown. Oak gall inks are total crap compared to carbon inks. For one thing, they are acidic and corrode the parchment or paper over time. You’ll like the carbon ink. I don’t see that it would hurt to try doing hides with lampblack, I mean that is what shoe polish is for. I wouldn’t call it dyeing though, more like painting. Damp rawhide can be stained permanently with pigments, even on the grain side and that is the whole basis for making parfleche too, so it seems worth the experiment. I would sort of suspect that it might work better, or maybe more importantly, rub off onto stuff less, if there was a binder, maybe a really light coat of drying oil like linseed. Anyway, that’s a really logical question, so someone has already done it, or tried it! If it works, there are probably old recipes in formulas books and such. Follow that link to google books and try some relevant search terms to see. You’ll probably find the most relevant concentration of results limiting the search to the 19th century. If you could do a custom limit, I’d probably run it into the 30’s. After that it’s better living through chemistry… Earlier stuff could be very good too, but it was in the 19th century that there began to be more scientific exploration and recording of methodologies. Before that there wasn’t much of that in the arts, and they were passed more directly from generation to generation. Your point about flames being interrupted is fascinating. It would explain why masonry heater builders recommend that you start your fire at the top of the pile and let it burn down from the top. This will make for a hotter as well as cleaner fire they say. Well, now I know part of why they say that. Thanks!! Good observation. I’ve used top lighting in some situations, but not that much. I know Kiko Denzer is a big proponent of that approach and I’ll certainly be playing with it more. I am rather interested in the tattooing with the lamp black, do you have further information on that?? Nothing I can quote, but it is what people used a lot. I’ve used it on a friend, but haven’t seen how it has held up. Probably 15 years ago or more. I think if you look around, you can find plenty of references. it’s hard to beat as a pigment for lightfastness, density of color and fineness.